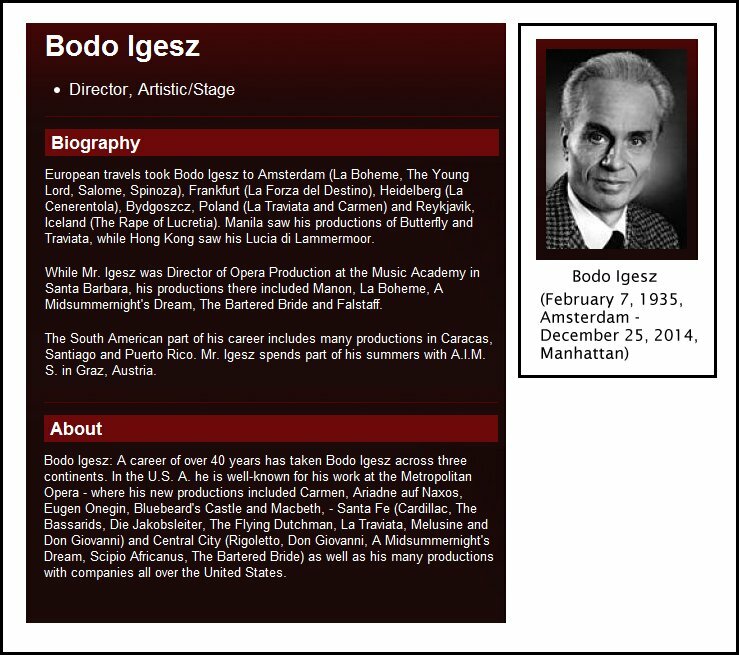 Bodo Igesz Interview with Bruce Duffie .. . . . . . . .
Bodo Igesz was in Chicago in February of 1988 listening to auditions, and he graciously took time from a very busy schedule to chat with me. Here is the rest of our conversation . . . . . . . . .
Bruce Duffie: From the viewpoint of the stage-director, where is opera going these days? Bodo Igesz: Along strange paths, I would say, very strange paths. I’m not very sure one can say where opera is going at all, but I hope it’s going somewhere. There are so many strange directions developing that you wonder sometimes if it will even continue. Duffie: [Genuinely surprised] Really??? So you’re not optimistic about the future of opera? Igesz: Not so very much. What you see happening at the moment in opera production is sometimes the strangest ways of re-interpreting old repertoire which has to be found because of the lack of new repertoire. That is a major problem. Very few worthwhile new operas are appearing on the horizon, therefore the direction that opera production takes is by hook or by crook trying to find new hats for old people. Duffie: Do you enjoy looking for new hats? Igesz: I do enjoy it if a certain opera seems to be right for that new kind of hat. What I think happens too often nowadays is that one chooses the hat first and afterwards asks what is the opera, and that is backwards. What you see happening often is that directors or designers have a specific style that they neither adapt nor change for whatever opera they’re doing. I have the greatest admiration for directors and designers who look at opera first and ask what it is about, and look at its history, and then try to find how to do it in the right way. It can be “right” for our time or “right” for all time, but they should not be looking to do their own ideas from this viewpoint or from that angle or in that style, and only afterwards ask what is the opera. That’s not done so much here in the US, but in Europe it happens an awful lot nowadays. Duffie: Is there any way to get more new operas written and presented? Igesz: You can give commissions, of course, but if you look at the lack of interest for the few “popular” modern operas, you see how badly modern opera sells. Especially in American there doesn’t seem to be much future for it. Duffie: Is this the fault of the composer or the performer or the public? Igesz: It’s not so much the fault of the public; I think it’s the whole development of music. Look at symphony programs. You’re constantly re-hearing the same symphonies of Brahms and Mozart and Schubert. I enjoy going to them no end, but you don’t see anything new appearing that really has a following. Opera, by necessity, needs a following because it costs an immense lot of money to put it on, and it’s done in larger opera houses. That, I think, is the crux of the matter. And because the same old repertoire keeps being repeated, you get this attempt to present the old things from new angles. There are only a few ways to do a piece that make sense. Duffie: Do you make sure everything you do makes sense on the stage? Duffie: [Interrupting] The music or the text? Igesz: Both together, and the background of the work. Then I try to find a style. I don’t necessarily try to find a new style. If a new style presents itself to me, fine, but I don’t admire those directors who look for a new style at all costs. That is something that doesn’t work. If a new line is the way to go, the new style will present itself to you. But to say the opera, whatever opera you’re doing, must play on Mars or in a steam bath, is very, very sad. Things like that have happened in Europe. Duffie: What is the right direction for you? Igesz: That’s a very difficult question. The right direction to me is something that for my eyes and my ears today makes sense to the opera in question. Duffie: So you re-examine it for each opera you do. Duffie: Then how do you decide which operas you will accept to direct and which offers you will let go to someone else? Igesz: There are certain things I rather accept, and other things I would rather not accept, but my various bills must be paid each month. In general I am basically interested in any kind of opera, and the more unusual the better. In my career I’ve done pieces where the ink was still wet as I was staging them. Sometimes the music was really awful, but thank God the libretto was wonderful, so it was great to do. Since I’m not the most famous director in the world, lots of bread-and-butter operas come my way, but I thank the Lord when I can do something else. I enjoy doing Monteverdi and Cavalli, as well as Berg and anything that I’ve not done in the last fifteen years. As a stage-director, I always keep looking for the chance to do certain works. Duffie: So even if it was a standard work, if you hadn’t done it ever or in a long time, you’d jump at the chance. Igesz: Oh, of course! There are some works you stage again and again, and others you wait for twenty or thirty years to do. For example, I just came back from doing my first Così Fan Tutte. Duffie: Did you put all the memories of having seen many performances of this opera to work, or did you scrap those ideas and start completely fresh? Igesz: I don’t think you can scrap that, whether it’s been good or bad. Duffie: So you learn from others’ mistakes? Duffie: And you learn from others’ greatness? Igesz: Absolutely. I hope everyone does! Duffie: Since you mention Così, who winds up with whom at the very end? Igesz: That was my first production, so the original couples wind up together. But Così is a very subtle work, and I don’t think you can put a very drastic ending to it. It wouldn’t fit with either the libretto or the music. But at the very end, I had the woman of one couple (Fiordiligi) and the man of the other couple (Ferrando) look at one another and make a gesture to the public that indicated they do not know what will happen in the future. That kind of subtlety is right with Mozart. Duffie: So it was the right thing to end with a question mark? Igesz: Exactly, and the libretto gives no indication. Duffie: Since you stage both old and new operas, is it more difficult to do a world premiere because there is no point of reference? Igesz: No, I don’t think so. It might even be easier because you have nothing to fight off. You start completely from scratch. No matter what opera I am doing, I always have the memory of a production I’ve seen somewhere, and even if you don’t follow the pattern, the good things you’ve seen will always sneak themselves in somehow. Duffie: And the singers will mostly have sung the work under different directors. Igesz: That I usually don’t find to be a problem. Usually there are very interested in what I have so say about the work. A major part of the work of a stage director is to be a psychoanalyst, to work on the psyche of people to get them to see things your way, and to make things work in a way that fits those people. I’ve never had the experience of someone saying he couldn’t do it any other way than what he’s done before. Especially in America, singers are more than willing, even grateful for the chance to do something new, especially if they’ve sung the work many times before. Duffie: Do you ever get too much rehearsal? Igesz: Too much rehearsal is worse than too little. I’ve never had too much. I’ve learned how to make do with one week or with two weeks or with three weeks or with whatever length of time there is. One time I had five weeks and I thought it would be a luxury, but we just managed to get it ready by the skin of our teeth. That was Henze’s The Young Lord, and it was the only time where, in the fourth week, I thought it would not be ready for the opening. Duffie: You work with big, established stars in the major opera houses as well as with students at the Music Academy of the West. What are the differences for you in those two situations? Igesz: I don’t think that you can really generalize it. “Working with major stars at the Met” really doesn’t exist. 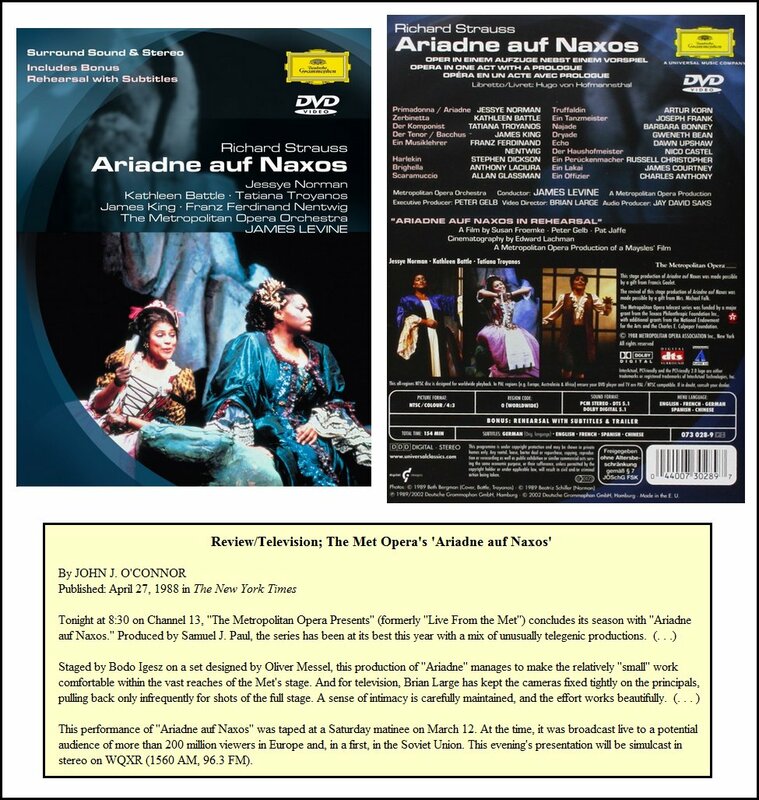 There is a vast difference between working with Elisabeth Söderström and with soprano X, and a vast difference between working with José van Dam and with baritone X. Singers can be difficult to work with or are protected by management or things like that, but in my personal experience that is very much the exception. The difference — which is why working at the Music Academy of the West is so interesting — is that you have the chance to discover roles with young singers because you automatically get people who have absolutely never done anything like it. When working in the big opera houses in Europe and America, there are certain things you take for granted that you don’t even touch any more. Suddenly, in order to take steps C and D, you have to teach steps A and B, and that is nice. Duffie: Now you’re in Chicago listening to voices. What do you listen for? Igesz: The musicians from the Academy who are here with me listen to the voices. I also listen to the voices, but I also look at how they present themselves and how they would develop as actors and whether they would fit into our productions. As you may know, Santa Barbara offers places for 20-22 singers, and since we’re doing Britten’s Midsummer Night’s Dream, most of the singers in our program will have to be in the production. So we’re especially looking for a certain amount of men. I suggested the opera, fully aware of the problems, including the need for counter-tenors! When we put an ad in Opera News, I asked that a note be included that counter-tenors could apply, and we’ve had several audition! I was amazed and yet pleased, having originally feared that we would have to get somebody from outside to do the role of Oberon. Since the program is not only opera but also lieder interpretation and art songs, we look for people who would benefit by joining the program in that department. Duffie: Are the applicants aware that a stage-director will be listening to the auditions as well as just the musical staff? Igesz: Probably, since I’m listed as Director of Productions. They sing an aria of their choice, and then give us a list of others from which we choose what we’d like to hear. Naturally, whenever possible we choose to hear something that will show different aspects of the voice. That can give a whole different outlook on the possibilities of the individual. Duffie: You then work with the winners at the Academy? Igesz: I just stage the operas, but with each one double-cast and the singers taking voice lessons as well as lieder classes, it takes six to eight weeks to stage each opera. Duffie: You’ve also worked in Europe? Igesz: I’ve worked in Frankfurt and in my home country in Amsterdam as well as other towns in Holland. I’ve also worked in South America, but because I live in New York and I’ve been at the Met for many full seasons, most of my career has been centered in this country. I started at the Met in 1963, which means I did two seasons at the old house. The new house is a big house, with all the advantages and disadvantages of a big house. It no longer has the kind of “company” feeling that it once had. It is constantly enlarging and getting to the point where it’s terribly impersonal, and that’s not very good for an artistic company. Duffie: Are the audiences different from country to country? Igesz: Oh yes, very much so. Until a few years ago, audiences were much more open to new things in Europe than they were here. That is not necessarily the audiences’ fault. There is much more introductory and preparatory work done by publicity in European newspapers. I often try to convince managers of regional companies to do lesser-known works, and they complain that they can’t sell them. But I’ve found even here that if there is enough publicity and lectures, and if the work is presented right and it is worthwhile, it will sell. Duffie: What makes a work worthwhile? Igesz: If it’s something that works onstage, that works in the opera house either as music or as drama or as both. There are certain works that audiences get bored with, and for good reason. They are not strong works. Duffie: Do you shy away from those that don’t work so well? Igesz: No. I like to try and make them interesting. I did Midsummer Night’s Dream in 1975 in Central City, Colorado. We sold out ten performances, and Colorado is not particularly operatic minded. It was publicized. I would love to do one of those wonderful Lortzing operas, but no manager with try it. They work in Europe, and with a good translation could work well here. But managers hesitate, and have a real fear of not selling. I think that fear is exaggerated. Duffie: Does opera work well in translation? Igesz: I’m not against opera in English at all, as long as it’s a good translation. Not those Ruth and Thomas Martin jobs, please. I’m not in favor of supertitles. They work for serious operas but not comic operas because the pacing of the titles is different from the stage action. Having said that, I should tell you that I make my own titles. That way I have control as to what appears there. I’ve noticed that other translators fail to take into account whether each title could be misinterpreted in a funny or pornographic way. I speak French and Italian and German, so it’s easy for me to say the titles are not needed, but I can see why the public likes them. Duffie: But you spend your life working with this tradition and passing on these ideas. What about the people who spend their time in other businesses and come to the opera after a long hard day at work? Igesz: The synopsis and a good production should be all that is necessary. There are a few exceptions, but in general, that should be enough. The idea of using subtitles came first from movies and then from TV, but that’s a whole different ball game. You are looking at the screen, and with the same look you see the action. I know many singers who feel it’s an insult to have these things flashing above them. On the other hand, I’m told that the titles seem to have brought more and new public to the opera. Duffie: The big question, then. Is opera art or is it entertainment, and where is the balance? Igesz: It’s both. For me, it’s 80% art. Igesz: Yes, but I’d rather have a good translation than titles. In serious operas, it depends on how important the text is. You have to be so careful what you translate for titles because much of what you translate is even more ridiculous than the original. I know because I’ve done it! 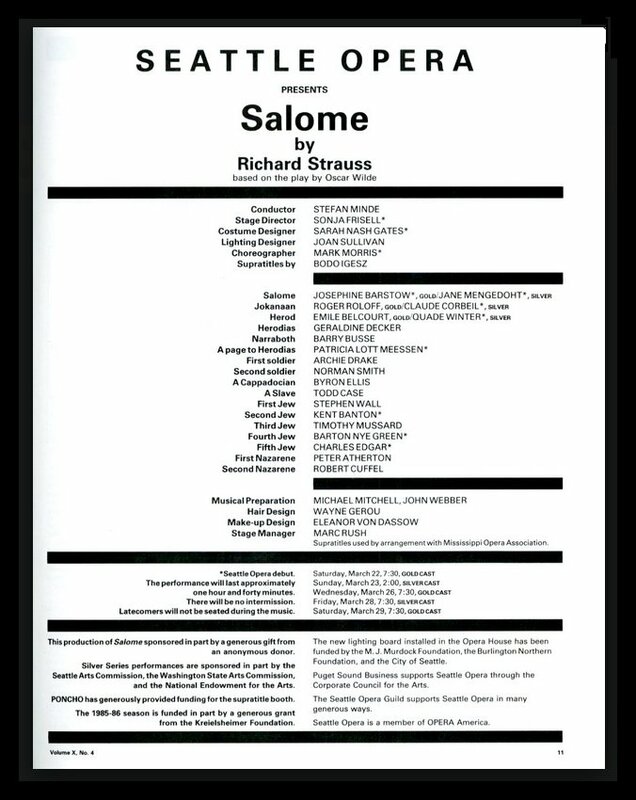 [See program from Seattle Opera below.] You can explain the story of Tosca or Rigoletto or even Trovatore in a very tight synopsis. Why do you have to understand every last word? Even if you speak fluent Italian or whichever language the opera is in, you don’t understand every last word. See my Interviews with Sonja Frisell, Josephine Barstow, Roger Roloff, Emile Belcourt, Geraldine Decker, and Archie Drake. Duffie: You don’t feel it brings the audience closer and gives them an added dimension? Igesz: It doesn’t give it to me. I can do that at home with my record player. I know I’m in the minority with that opinion, though some do agree with me. Duffie: Of course you’re working primarily for the Met, whose management has said there will not be titles in their house. Igesz: That has nothing to do with it. I don’t speak for the Metropolitan. I often disagree with the Metropolitan and they very often disagree with me. I’m not sure that people get more out of opera now than they did twenty years ago. It’s an acquired taste. Duffie: Is opera for everyone? Igesz: No, I don’t think so. Duffie: Then what is the purpose of opera in society? Igesz: What is the purpose of plays or concerts or football matches in society? Duffie: [With mock horror] Are you equating the Chicago Bears with the Lyric Opera??? Igesz: Some people are as enthusiastic about the Bears as others are about Opera. That’s everybody’s own personal choice. It’s interesting what you say. What they’re trying to do with subtitles is to draw everybody into the theater — even people who are not that interested in it. It’s wonderful to sell seats, but maybe that is the wrong way. Duffie: What’s the right way? Igesz: Doing good productions and presenting works that get people interested! Do works that are accessible, such as a good Fledermaus or a good Abduction. Also do youth programs and dress rehearsals for youthful audiences. It’s difficult for me to discuss this because I’m from a European background. It may be a little bit different here, but the whole thing gets much too much stress at the moment. In the final analysis, they do more harm than good. Duffie: Do you think opera works well on the television? See my Interviews with Tatiana Troyanos, James King, Barbara Bonney, Dawn Upshaw, and James Levine. Igesz: Certain things, yes, especially the way the technique has gone ahead and the quality of the TV broadcast has improved. It has the disadvantage of people seeing that one Turandot or that one Turn of the Screw and thinking that is the way opera has to be. The same is true with audio recordings. I have lots of records, and I prefer the “live” ones to the studio ones. I like recordings and I like live performances in the theater, and you can’t compare the two. Duffie: Is there anything you can do to streamline performances a bit? Igesz: I like to eliminate intermissions. The Marriage of Figaro should be done with one intermission, and Bohème with two, not three. But doing that depends on where the production is being given, and takes a certain sophistication on the part of the audience. You can’t play high-and-mighty and say the audience must sit for an hour and a half. Festival situations are different from subscription evenings after workdays. Duffie: What about cuts in the music? Igesz: That depends on the conductor and the director. There are many cuts that are traditional. They are done just because it’s always been done that way, and it’s wonderful to open those cuts. Then there are cuts that have been made for a Very Good Reason, often by the composer himself. We can judge these things by performances that are now being given completely uncut, and you wonder why on Earth must we do it with every repeat. It’s very nice for a recording, but not in the opera house. That’s very personal and everybody will judge it differently. When I begin working on an opera, I try to look at the libretto as though I’ve never heard or seen it before. That’s a very good standpoint from which to view the whole score. Then when it comes to cuts, I ask if it adds to the performance to open the cut. Duffie: How closely do you work with the scenic designer? Igesz: If it’s a new production we work very closely. But these days with the lack of money, regional companies don’t do many new productions. They will rent a setting or use an existing set and change it around. That’s sad. But to do a new production is wonderful, and for a stage director it’s gourmet food. Duffie: How closely do you work with the lighting designer? Igesz: Usually very closely. The ideal situation is when the set designer is also a very good lighting designer. I’ve done many new productions with someone who did both, and it produced wonderful results. But I must say that today there are many fabulous lighting designers. I grew up at a time when Europe was discovering that lighting could take the place of 50% of the scenery, and I’m very much of that belief. If you have a really good lighting designer, you can come out with a far smaller budget for scenery. Duffie: What advice do you have for someone coming along who wants to be an operatic stage director? Igesz: Try to find a really fantastic stage director whom you can assist in a theater for a few years. I’ve worked with Zeffirelli, but I learned from only one man — Gunther Rennert. He would meet an opera on its own terms. Duffie: Would you allow someone to apprentice themselves to you? Igesz: Yes, but I would not advise that. I’m not that great. I have people asking me, but I’m not so filled with ego. I can do very good productions and I have a good knack for working with people, and it happens from time to time that I will let someone work with me for a while, but I don’t pretend to be someone at the highest level. Igesz: Yes. It can be bloody murder, but to me it’s mostly fun. Otherwise, I wouldn’t have stuck with it for thirty years. Duffie: Do you have any advice for young singers? Igesz: Try to get somewhere and find a company who will hire you on a season’s basis. Not a huge house like the Met, but one where you can sing a lot of big roles and small roles during the season to learn. The Lyric Opera Center for American Artists is great. Then don’t shout it all away in the first five years of what could have been a forty year career. That happens so often. Get experience, and for Heaven’s sake, get your languages together. There are so few people who really know how to do French, Italian and German. I’ve seen works in Swedish or Russian or Czech — that I don’t speak — and I take the trouble to read the synopsis in an opera guide that I have. I also read the program. Until recently, nobody in Europe would dream of having subtitles in the opera like they were in movies. I find that for myself, I get the very best results when I do a work — any work, old or new — for the first time. A second production of something will never be as good as the first one. Somehow I fail to bring that kind of freshness to it. 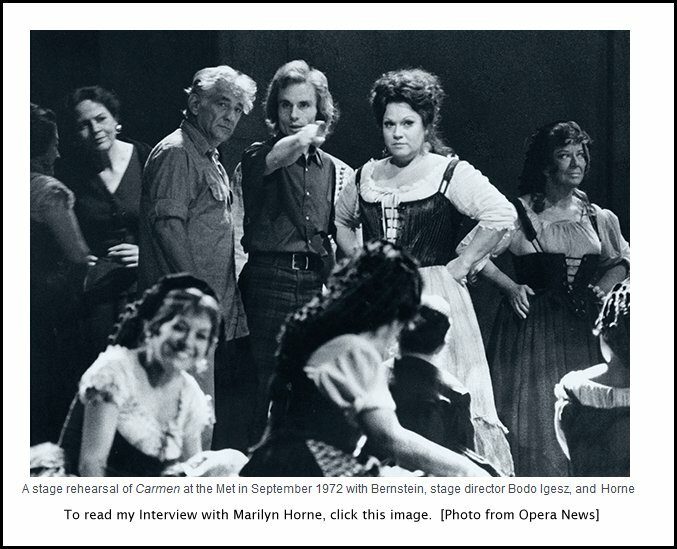 Opera is a conglomerate effort — singers, designers, conductor, director. The stage director can be over-accentuated these days sometimes. I’m not doing MY opera, but rather the COMPOSER’S opera. It’s as I see it, but it is the composer’s opera. To prepare a production, I work very hard at home and write down everything I want to do. Duffie: Then do you slavishly stay with that? Igesz: I stay slavishly with the general concept and embroider onto that. My experience is that singers are intensely grateful if you work with them like that. Singers have the responsibility to know what is in the score when he comes to rehearsal. A director, unless he is a Brilliant Improviser, must have a certain detailed idea of what he’s going to do. Singers have told me horror stories of working with directors who block scenes and then after a few days re-block, and later re-block again. They arrive without the foggiest notion of what they’re going to do. Problems have to be worked out ahead of time, unless something just doesn’t go well. Duffie: Do you capitalize on the strengths and weaknesses of the singers? Igesz: Oh yes, definitely. And having worked with many of the artists, I will know some of that in advance. The world of opera is not so big, and if you don’t know someone, you don’t plan something terribly tricky. You can always add more if the singers are up to it. Duffie: Do you have any advice for the established singers? Igesz: Life is going too fast, especially for musicians. You have to get there the next day instead of growing slowly. I’m always intensely happy to meet a singer who says he was offered a role and told them maybe in 15 years. Thank Heavens, somebody who thinks. I also did plays early on in my career, but I am very happy doing operas as long as the general working atmosphere is nice, and usually it is. I’m not a frustrated conductor, but my hobby, when listening to broadcasts and recordings is conducting. Duffie: Does that make it better when you’re communicating with the conductor on a production? Igesz: Oh yes. I think so. I hope so. Duffie: Is it at all frustrating to work every day until the premiere and then leave town? Igesz: Yes. It’s always a letdown. On the other hand, you don’t have to see your product disintegrate after a few performances, which often happens. Duffie: Do you come back after the third or sixth performance and do a little touchup or scream a bit? Igesz: [Laughs] Well, you don’t have to scream, but I give notes. Usually the first, second and third performances are the best of the production in the opera world. It’s different if you have an ensemble theater and a cast that is the same throughout. Duffie: I would think a new cast member might keep everyone on their toes. Igesz: Yes, but it’s not the way to keep a wonderful production alive. This conversation was recorded in Chicago on February 13, 1988. The transcription was made and published in The Opera Journal in March, 1995. It was slightly re-edited, the photos, links and biography were added, and it was posted on this website in 2016.